This is my mother’s recipe and it is one of my all time favorite salads. She makes this to accompany rice and curry, but it could be served along side any meal. Anyone who tries this dish remarks that they have never experienced eggplant this way. Lightly frying the eggplant takes away the bitterness and serves as a nice contrast to the other fresh ingredients and slightly sweet dressing. You will be amazed at the combination of flavors! For even more flavor, try frying some thinly sliced bitter gourd and mixing it into the salad with the eggplant. Bitter gourd can be found in the summer and some farmers markets or in Asian markets. It’s VERY bitter but also will mellow with frying and make this salad over the top! Mix turmeric, salt and water in a bowl. Dip the eggplant slices into the mixture to keep them from discoloring and set aside. Pour canola oil into a small keep pan, about 2-3 inches deep. . Heat the oil and fry a few slices of eggplant at a time until slightly golden. Set aside on a plate lined with paper towel. Place another paper towel on top to absorb more of the oil. Make the dressing by adding lemon juice, a pinch of salt, pepper to taste, sugar, and dijon mustard to a small bowl and whisk. 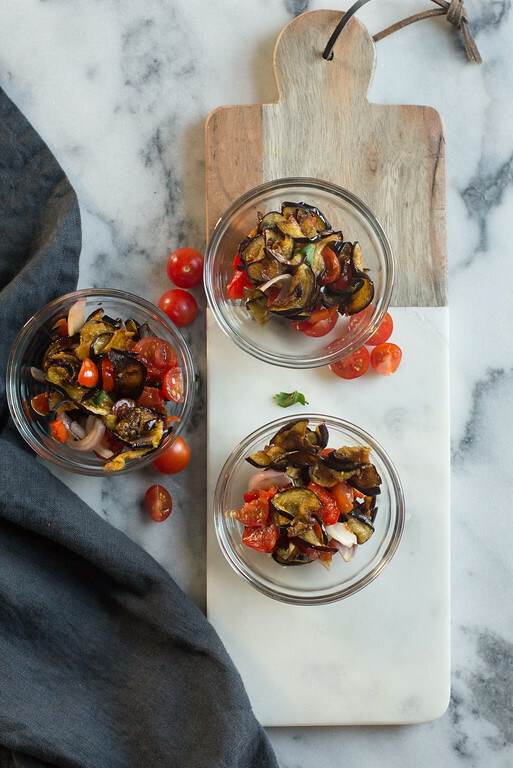 Place eggplant slices into a serving dish with red onion and tomato. Toss with dressing and serve.